And mom can be, too. Oh no! Those eggs are how old? If I use that mustard with a date of 2014 stamped on its label, will I die? The next thing I know, I’m hurtling things toward the garbage, cursing under my breath the whole time about how much money I’m wasting on food. SO, WHAT’S THE REAL DEAL ON USED BY DATES? Most of food date labels (which also read “sell by” or “use by”) are just suggestions from food manufacturers for peak freshness and taste. They’re not an indication of the safety of the food, nor are they health concerns. Because there are no standards for the wording on these labels, and labeling practices vary by manufacturers and product types, they can be confusing to interpret. Most foods can be eaten days – or even months – after the due dates have passed. Our bodies are well equipped to figure out when food is spoiled, Dana Gunders, a senior scientist at the Natural Resources Defense Council, told the Times. In other words, sniff it and it will smell bad; taste it and you might want to spit it out. What’s the worst that can happen? Your stomach will bother you. If you see mold on the food, that’s a sure sign to toss it. 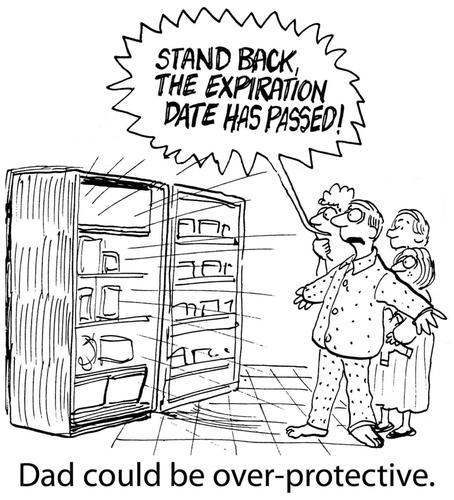 Refrigerate foods within two hours to avoid bacteria that can grow on many foods, causing illness. In the summer, move faster, and make that one hour. 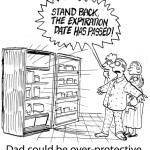 AND WHAT IF YOU WANT TO PRESERVE THE FOOD TO EAT LATER ON? If you have things like sliced bread that might be sitting around before you get to finish it, freeze it. Store cheese in wax paper – it preserves better than plastic wrap. Ready-to-eat refrigerated foods. Best to use them ASAP. Temperature of fridge? Keep it at 40 degrees F. or below. Keeping your fridge clean is not just so you can open it and feel good that it’s gleaming: Listeria can spread between foods through spills. Keep raw meat, poultry and seafood separate from other foods in your fridge. Eggs can be eaten up to three to five weeks after their “use by” date. A good test: Drop the egg into a glass of water; if it floats, dump it. A sinking egg is a safe egg. I had forgotten about using wax paper—it is one of the most unused products in my kitchen, falling way behind the plastic wrap and aluminum foil! Thanks for the reminder.